It's been a long road David, but you made it! and sustained serious head injuries. David has been hospitalised and is still rather poorly at this time. David's wife phoned this evening and David is holding his own. He is still in an induced coma and is being brought out for a very short time. David has had a scan and thankfully there are no internal injuries. There are injuries to his back but mainly the injuries to his neck are causing concern. The 'top man' visited David and apparently it is a blessing that he has two brain fractures as these allow the brain to swell. Due to his back injury his stomach is very swollen and this is pushing up into his lungs causing him not to be able to breath on his own. When this eventually corrects itself the hospital will put him in a brace. The Consultant has told Christine that it will be a long job. I am in possession of David's wife's temporary address which for obvious reasons I will not include in this update. If you would like to send a card or similar item of support, then please email me and I will forward the address on to you. 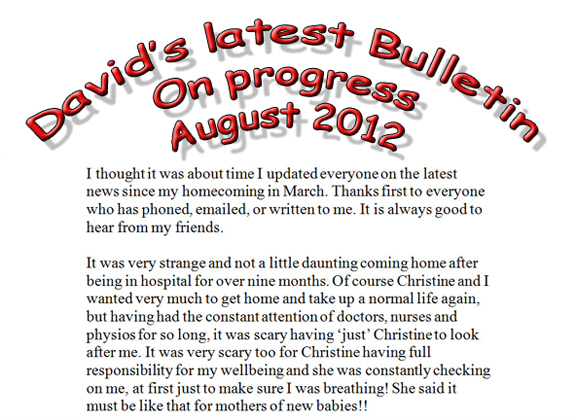 Christine has asked me to give you an update on David. He is much more aware now. He has tubes in his mouth providing oxygen so still cannot speak - the hospital was going to carry out a tracheotomy yesterday but for reasons only known to them they cancelled the surgery. David is still very uncomfortable, obviously feeling the bruises and bumps. Christine has asked if you can send a letter or informative card to David about life outside the hospital because she has been advised to read to him as much as possible. She feels he will enjoy that. Wessex Neuro Centre, Southampton General Hospital, Tremona Road, Southampton SO16 6YD. Please pass this information round to other members who do not have computers and I will update you again when we have more news. On Friday last week David had a tracheotomy fitted plus later in the day a halo from the waist up to his head which is held by four bolts. During the weekend they fitted a speaking valve and he has had to learn to speak and his speech has slowly improved. Monday was Christine's birthday and David managed to tell her and the ward at the top of his (funny) voice that he loved her. You can only imagine Christine's delight - last week seeing David's face for the first time since the 20th June and then he speaking on Monday. David can only speak for ten minutes in the morning and fifteen minutes in the afternoon for the time being so Christine and he are catching up very slowly! David can now feel and move his legs and they have confirmed that he has no broken spinal column which is a big relief. 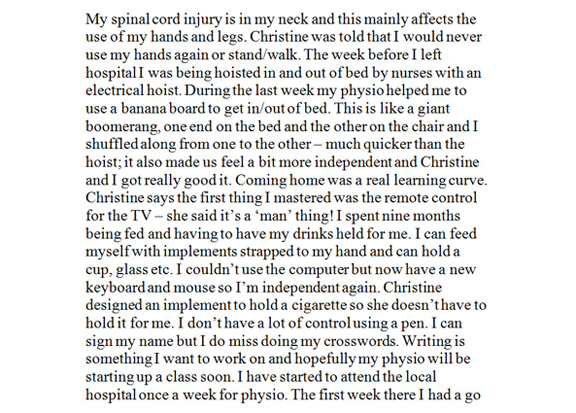 Christine is worried about his hands though as he has no movement in his fingers at the moment despite under controlled conditions he lifted his left hand. He is not out of the woods yet! I did ask if David had received any correspondence at the hospital and she said "No" so I am hoping that some of us will drop him a line or two for her to read to him. If you need the address again please do not hesitate to contact me. Not all is going well for Christine at the moment however, her elderly mother badly gashed her leg and has to go into hospital for a skin graft - it all comes at once!!!!!! moments as you will see when you read her email. That's it for now. Hope all is well with you. David had his surgery yesterday - 7 hours - he can move his arms and legs but at the moment has no feeling in his hands. They took away the four broken vertebrae and replaced them with bone and metal. He naturally has a collar on for six weeks but not one that was as severe as the halo brace. He is eating pureed food, can speak and already giving Christine orders!!!! David lost all his top teeth in the fall and my wife has promised him a kiss when he gets them replaced - if that's not an incentive I don't know what is!!! The hospital has transferred him to an Orthopaedic Ward and he is getting great care. Providing all goes well between now and Monday the hospital will be looking to transfer him to a hospital in Salisbury for further treatment. All our prayers answered - what a relief for Christine, his family and friends. Spoke with Christine this morning regarding David. He is number one on the list to be sent to the hospital in Salisbury but until two other patients are found suitable properties to go home to he is to stay where he is. She feels everything has come to a grinding halt! The Salisbury Hospital allow him one weekend away from the premises so he is hoping to attend the Reunion. David is eating soft foods and has a reasonably good appetite. David is on Ward F4 in the main General Hospital, Southampton, and visiting is from 3.00pm to 8.00pm. It's heartening to hear some good news!!!!! Good news from Chriistine - David goes to Salisbury today, possibly for 6 - 9 months! He has the collar removed next Friday so that will give him a little bit of freedom. No details as such regarding visiting yet but David has been told that he will have a Timetable for a week at a time; visiting will be allowed in between his classes and Christine has specially asked that you please check with the hospital/ward BEFORE you visit as we must bear in mind that for the first few months David will be very worn out after doing the classes. 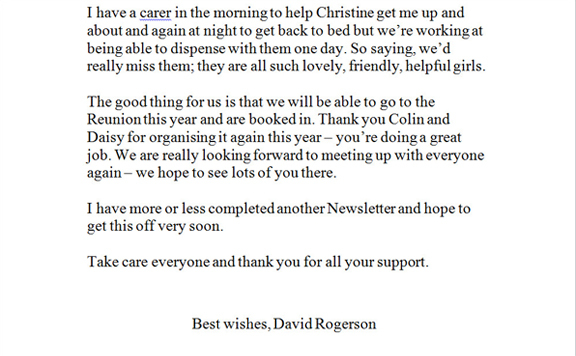 Christine sends her thanks for all for the help and support they have been given. x-ray, scan you could imagine. He will be kept on bedrest for about 10 days to build up his strength. The food is marvellous and cooked fresh and all his needs are catered for. He now has a buzzer he can work to call a nurse for help, TV and radio which he can work - just by tapping a pad - obviously he still does not have much use in his hands. The whole work ethos has now been explained to us. He will be given a calendar every Friday mapping out all his classes. Patients do not do extended physical work as this has proved detrimental to progress, but only an hour at a time and probably only two sessions a day. Then scattered during the week he will have other lectures, occupational therapy, computer classes etc to attend. Leisure time is very important and they have lots of time in between to rest and have visitors. Once he is in a wheelchair, he will have access to the unit's facilities and leisure areas. It all feels so much more positive now. We have spoken to the doctors and they agree that visitors are a welcome distraction. You may have to wait while he finishes a class, but the surroundings are pleasant! I know various people have said they would like to visit and David would welcome them. Visiting is between 11 am and 8 pm. David is doing well. He has got quite a lot of movement back in his arms, legs and hands. The hands are slower than the rest because when you break your neck and have spinal damage there, the hands are the main things to be affected, but the hospital are hopeful with work they will improve. Of course that makes everything difficult for David, having no use of his hands. He worked up to 2 hours in the wheelchair but got a red mark on his bottom. This is quite normal and is not a bedsore. thankfully with the expert care he receives he is free of them. Another problem with spinal damage is sensitive skin. The neurological system works overboard and upsets lots of things. He had to go back into bed, off his back for a week, but is now up and about again. Another problem is excess wax in the ears. He was hoping to have his ears suctioned yesterday but we couldn't get him to his appointment in the other hospital in time, so that will be next week now. Then he will be able to hear properly again. It is so isolating not being able to hear. Occupying David is no problem. We spend a fair bit of our time dealing with his correspondence, he still maintains his Shares files and other financial affairs. Also we have developed quite a social life with the other patients, relatives and staff and have a lot of fun. In between all this, David manages to fit in quite a lot of physio. After all this, it is nice just to relax, talk and play games, do crosswords, quizzes etc. David is still the same man, thank goodness, he is still funny, witty and very loving and there is nowhere else I would rather be than with him, wherever that is! I am very thankful that I still have him. At first they didn't give much for his chances but he got through that and will get through his recovery in due course. He has improved hugely since he arrived at Salisbury and they are really pleased with his recovery so far. Today they are hoping to do his physio on a tilting table. This will start to get some real feeling back into his legs etc. It will be the first time he has been really upright since the accident. He will be strapped to the table and do his normal physio at the same time. Next Tuesday they hope to get him in the swimming pool and the hydro pool. He can't wait for that - to feel his feet on the bottom of the pool. They say these two things are the next stage of his recovery and he will be able to work harder with that. Shame he can only get in the pool once a week, due to pressure on staffing. It was David's birthday on Wednesday. Our friend made him a lovely decorated sponge and also a dozen beautifully decorated cupcakes for the staff andhis sister made him a lovely fruit cake. These went down very well with staff and visitors. As soon as David is up in the wheelchair for longer he will see the dentist in the main hospital and get a denture. I think everyone knows that he knocked all his upper front teeth out in the accident and the back upper ones fell out in trauma. Eating is a little more difficult (he can't have the steaks he so loves) but he is managing very well with food and is gaining some strength and muscle now. He can't wait for his new teeth!!! David and I know that it is going to be a very long job at Salisbury and he is quite prepared to stick with it and make the best possible recovery. We are aware that he could be here for 6 - 12 months but David is not disheartened and just determined to get as fit as possible in as shortest time as possible. We are looking forward to his first weekend home. 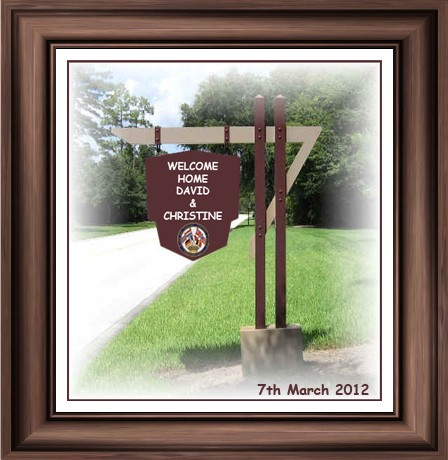 David would like to thank everyone for their cards, emails,letters and visits. He appreciates the time everyone is giving him. Just thought I would send you all a ‘catch up’ on David’s progress. Sorry to all those people who have already heard this news because they have emailed or telephoned recently; you are on my distribution list, so I have left your name there. What some great days David is having. Firstly he doesn’t have to wear his collar any more when he is in his wheelchair and so now he looks absolutely normal when he is out of bed and dressed (well apart from no top front teeth which he knocked out in the accident!!!!). He is out of bed for now for four hours and feeling much more comfortable in the chair. We go over to the main hospital for a coffee and it is a bit like a home from home with other patients from the unit and their families so quite good fun. On Sunday David's brother and niece visited and came with us. Ruth cut David's hair while she was there so he looks all fresh and handsome again! Then we went back to the Day Room and David watched football on the huge TV (Tottenham who he loves) with the other chaps. They were all talking the game so that was good for him to have lots of 'men' talk. Then he got back into bed (no marks on the bottom - fantastic) so he will build up more time each day. It was lovely - it was like getting him back as he was before in lots of ways. He went into the hydro pool last week which he loved. Things are really going in the right direction. We know it will be slow but at least it is sure. David went back in the pool again on Tuesday for an hour and during that time the physios let him put his feet on the bottom. They put weights on his feet and he walked, easily, 12 lengths of the full size pool!!! He had a physio on both sides of him - all they did was held his elbows, no other support. We’ve known for some time that his legs are strong but did not know if he could co-ordinate the act of walking, but the good news is he can. It was fantastic to see and I must admit I had a few tears to see him on his feet again. He has such a wonderful fighting spirit. David has now had a go at a special bike and has pedalled the equivalent of 2k with his legs and 1.7k with his arms. Physios are delighted with him. 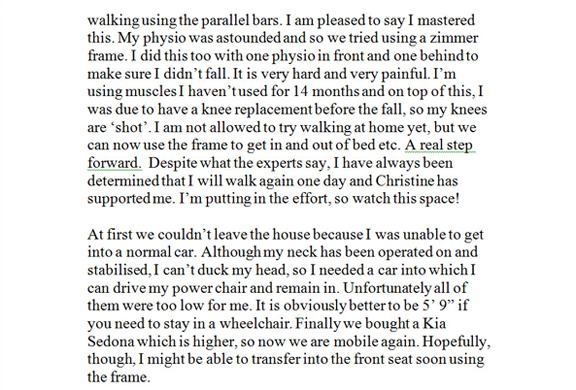 We are not kidding ourselves, we know it doesn't necessarily mean he will walk again, but he has a good chance. He has also managed to hold some things in his hands, although he still does not have enough power in them to do much yet. I have now found somewhere really lovely to stay. It is only 5 minutes from the hospital and the owner of the house is really nice and so accommodating. I will stay there 3 or 4 nights, home 2 nights and Mum’s 1 or 2 (try to figure that one out!). I have been staying in the bungalow owned by the League of Friends. You have to share a room and pack your case up each night so it is not very settled but nevertheless I was grateful. It’s odd waking up in the middle of the night and trying to figure out where you are sleeping tonight. David sends his very best wishes to everyone and does enjoy your emails, letters, cards etc and visits too. David is doing so well. He looks really good. If he had his top front teeth, he would look completely normal! He has seen the Ear, Nose & Throat doctor. From the scans and x-rays on his head, it appears that he may have damaged his ear drum in the fall. As we know, he fractured his skull quite badly in several places. David does not want any surgical repair done at this stage, so they are going to try him with a hearing aid first. He should get this any time now, so we hope that will improve his hearing. David has lost over three and a half stone since the accident and was looking pretty gaunt. He is now putting on a little weight and his face has filled out again and gradually a bit of muscle is returning. He is now out in the wheelchair from about 11 am until 5 pm and his skin is good when they put him back to bed. They will gradually creep the time up half an hour a day until he is out of bed for 8 hours. He has had a go at moving the chair himself but he does not have a lot of power in his hands so although he can go in a straight line easily, it is not so easy to negotiate corners etc. He is determined to get more use back in his hands and is doing all sorts of therapy to strengthen them and they are definitely improving. His shoulders are a bit stiff too and he is working on them. A couple of weeks ago, he wouldn’t have been able to hold his arms out in front for more than a moment or two, but now does quite fiddly therapy with his hands, where he has to have his arms stretched out for extended periods. Although his fingers are still stiff and painful, they are improving. We had a Goal Planning Meeting last Friday. This is to plan goals for the next month. David wants to (1) Get his hands working better (2) Get on his feet on dry land (3) Be more independent and have the use of an electric wheelchair (4) Feed himself/Clean his own teeth (5) Look at possibility of having a few days home at Christmas and (6) Plan for a discharge date to work towards. More on these goals later. David continues to go in the hydrotherapy pool and does very well with his physio. He is still walking in the pool and practices standing still upright and balancing too. I must say it is very difficult to stand still and upright as I found this week when I was allowed in the pool with him. It is gorgeously hot – 35 degrees. It was wonderful being next to him upright again. I suppose I had forgotten how tall he is, having been laid down or sitting for so many months. I must admit, we sneaked a little kiss and cuddle together. The physios are really good fun and we got told to behave – no petting in the pool! What spoilsports. They are hoping in the next week or two to transfer this to attempting to stand on dry land. We can’t wait to see if he will be able to support his weight. What we want more than anything is (a) to walk a few steps so that he can have access to all areas of our home and (b) to get his hands working well so that he can do as many of the things he did before as possible. I don’t care what he says, though, I am drawing the line at him chopping wood!!! David can now feed himself all his meals when he is in his chair but can’t manage when he is in bed as he is at the wrong angle. He can also clean his own teeth at the basin when he is sat out. Work on his hands and legs is obviously ongoing but definitely improving. Today he had his first go in an electric wheelchair. Physios showed him the controls and he was able to manage them without any adaptations. The two physios were both very impressed with him. He went all over the hospital with them doing all sorts of things. Getting into tight places, reversing into his bed space, going through doors and doing 360 degree turns. He did everything and didn’t hit anything. They said he was the best they have ever seen for a first attempt. That’s my boy!! There could be problems about going home for Christmas. We still have a month. To avoid having a carer come in a couple of times a day, David would have to learn to transfer himself from his chair to the car, chair to bed etc. If he can’t, they say it would be difficult getting the appropriate type of help over the Christmas period. So, David may stay in the Centre for Christmas with Mum and I with him. The reports say that that they have a fun time and the Christmas dinner is good. We had planned to make this Christmas different – probably not exactly what we had in mind, but we are willing to embrace change, in fact we are getting good at it! We were also surprised to get a discharge date of the end of February. We were expecting them to say probably April. Obviously this is not cast in stone. They want David to go home with the best recovery possible (so do we) so they say if at discharge date they think they can improve on anything, then they will extend his stay and we are happy to agree with that. David is still cheerful and positive and very determined. He often takes me over to the main hospital to the restaurant there where he buys me a coffee. In the next week or so, we will cancel either his lunch or dinner and go over to the restaurant for a meal together. Also in the next couple of weeks, we can get the bus into Salisbury and have a mooch around. These are two things we are really looking forward to. I personally think things are looking very positive for David and the staff are very pleased with his progress. I am very happy in the house I have found to stay in. I have a bedroom, my own bathroom and toilet and use of the kitchen and sitting room. The lady who owns the house is lovely but works very long hours in publishing so I hardly ever see her but we always leave each other notes. She is so kind to me and treats me like a treasured guest. The house is huge and gorgeous and best of all, less than five minutes from the hospital. I have only been here two weeks, just 3 or 4 nights a week, but am already feeling far more rested. David and my Mum both feel happier for me too. David has asked me to thank everyone for their letters, cards, visits, phone calls to me etc and for all the good wishes he is receiving. It is cheering for him to know that he is not forgotten. He sends his very best wishes to everyone. I also send my love and best wishes and thank everyone for their continued support. We will send out another bulletin before Christmas. We thought you might be interested to hear the latest news on David’s progress. David has his power chair and is completely independent now. He can take himself off to his Occupational Therapy and Physiotherapy sessions and doesn’t have to wait for the nurses or me. Hydrotherapy hasn’t happened for the last three weeks. His physio was on leave and then Christmas meant some things had to be shelved. This starts up again this week and we are both looking forward to getting in the lovely warm pool. I go in too now and help during his physio session and then we are allowed to ‘fool about’ together for 15 minutes before we have to get out. Two weeks before Christmas, David’s OT Sue took us into town on the local bus. I went too and she showed me how to get him on and off the bus, where to pick up the bus etc. We passed the test with flying colours and now we are free to come and go as we please when David does not have any sessions – mainly weekends. Well, needless to say we couldn’t wait and went to Salisbury City Centre the very next day. We managed very well. David has fantasised about having a burger, probably for the last three months. Funnily enough we only ever have them about twice a year, but he has really fancied one, so we headed straight for Burger King where he had a Double Whopper, Fries and a Milkshake and ate the lot!!! Then a couple of days before Christmas, a few of us took taxis into town and went to the Carol Service at Salisbury Cathedral. This was beautiful and another learning curve to take a wheelchair taxi. On the run up to Christmas, staff arranged for a Jazz Band to come in to entertain us. Another evening we had a quiz and another pizzas were brought in. We had Christmas in the Spinal Unit and the staff did their very best to ensure we had a good time. Of course it was very different and not home, but my mother joined us for three days which meant that at least we were all together. One way and another we had fun. We have both made a lot of good friends here; friends who will probably stay with us for ever. The unit has a wonderful atmosphere, the staff are really dedicated and happy and the patients cheerful and determined. Since Christmas, the two physios have been working very hard with David and have had him standing up in a standing frame. He can get up under his own steam with only the tiniest bit of assistance. His legs are really strong. He has not attempted walking (on dry land) yet. They feel it is far too soon and he agrees but the fact he can get up is marvellous. He has also worked this week on ‘transferring’. This is something which would be a wonderful advantage and would allow him to move from chair to chair, chair to bed and chair to car seat. This would really cut down on any assistance he would need when he is discharged. He has also seen a dentist who hopes to start working on his teeth at the end of January. Everyone who visits says how well David looks and how much he is improving. He is working hard on getting his hands moving. We know they will never work perfectly again but he will give it his best shot. We are working on the premise that he has another two months before the proposed discharge date of 29th February. A lot can happen in two months, so watch this space!!! We both hope that you all had a wonderful Christmas and would like to thank everyone for their Christmas cards, emails etc. We love hearing from you. We both wish you all a very happy, healthy and peaceful 2012. Just to let you all know that we are still on target for a discharge date of 29th February. David's rehabilitation will be ongoing after discharge with the help of a physio who will come to the house to work with him. Also I have been taught how to do one or two exercises to do with David daily to try to strengthen his arms and improve the movement in his fingers. We do realise now that his arms/hands will never be strong enough to support him and enable him to use crutches or a frame and this is because of the position of his spinal injury - his neck - injuries to neck always affect arms/hands. David continues to stand in a frame and work on strengthening his legs so he may or may not walk in the future, we have no way of knowing yet. However David is very adept in his power chair and manages to manoeuvre it successfully with his fingers. David has completed all his preparatory work with the dentist. He knocked out quite a lot of his top teeth, "roots and all" but some were broken off leaving the roots behind. These roots have all been removed and he will have to wait until he gets home to have a top denture made. All went well and he is now back to eating everything quite well, except for his latest craving - a T bone steak! I think he is going to have to wait a little while for that! I am working with our local Occupational Therapist to prepare for David's return home. As he cannot go upstairs for the foreseeable future, we have decided to convert David's Snooker Room into our bedroom. For the next few months David will have to continue sleeping on a hospital bed with special spinal mattress so this will be delivered in the next week or so. I have bought a single bed to place alongside David's so that we can be together again. As soon as possible, we will build an en suite walk in shower alongside the loo already there. After a few months when David can come back into our new big bed, we can move that down and pick up where we left off in June! This weekend we are having a "dummy run" for going home. The hospital has a self-contained flat and we are moving to see what help we might need and to highlight any problems we might encounter. We can't wait to get home together, although some things do seem a little scary. However, we are determined to carry on in the same way and treat the whole thing as a challenge and an adventure. David is still very positive about everything and I would like to think that I am too so we will face what life throws at us together and overcome everything and continue to have a wonderful, loving life together. Once again, both David and I would like to thank everyone for their support and for telephone calls, visits, letters, emails etc. 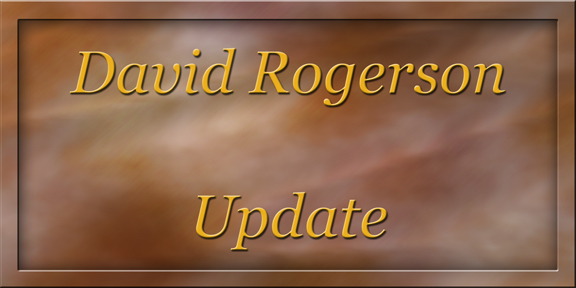 David's intention is to produce another Newsletter during his first month at home so I expect the next update will be contained in that.